There are paths that run the entire stretch that make for a glorious place to walk, jog, rollerblade, bike or just get some sun and people-watch. Whether your interest is canoeing or ice skating, baseball or in-line skating, the Charles River is a beautiful resource. There is also a terrific new playground for kids to enjoy. On sunny summer days, you'll find hundreds of people out sunning themselves, taking advantage of that great breeze that comes off the Charles. Along the way, you'll find a community boat launch, a small cafe that is open during the summer, and a number of sitting areas. If you go far enough, you'll discover Stoneham Playground. And don't forget the famous Hatch Shell, where summer concerts, movies, and performances take place, as well as the Annual 4th of July Fireworks Extravaganza featuring the Boston Pops. 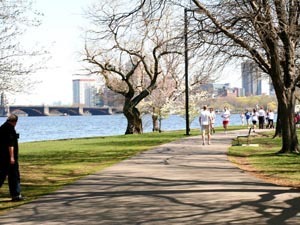 People who drive along Storrow Drive probably gaze toward the Charles wishing they were enjoying the comforts of the park instead of being caught up in traffic. It is Storrow drive that separates this MDC park area from the rest of Boston, which makes it a little tricky to get to. There is limited parking along Storrow drive so it is important to know how to get to the Esplanade. Running through traffic is not the desired way. Instead, a number of pedestrian bridges are available. You can find free 2 hour parking at the end of the Charles River -beginning of Storrow Drive behind the police stations/science museum. Our favorite is the one at the end of Charles Street. That way you can really make a day of it by cruising the Boston Common or Public Garden as well as having access to some great little shops and eateries. Visit our Listing on FamilyZip for photos, insider tips and more information. Take exit number 26, to Storrow Drive west. Follow Storrow Drive, bearing right at any exit forks, until you approach the Arthur Fiedler (small orange) footbridge and Copley Square exit. The Hatch Shell will be on the right along the Charles River. Red Line: exit at the Charles/MGH stop and cross the Arthur Fiedler footbridge to the Esplanade. Green Line: exit at the Arlington stop, walk up Arlington Street towards the Charles River, and cross the Arthur Fiedler footbridge to the Esplanade. Community Boating was the country's first, and remains among the best, public boating program. For a modest fee, thousands of people have learned to sail on the Charles River. We love this part of Boston. One favorite area is the playground just west of the end of Storrow Drive where the State Police facility is. There's a nice, big playground with seperate structures for big and ltitle kids. There is a splash pond for when it gets hot. You can watch the duck boats go thru the lock on the side of the Museum of Science. Best of all there is a parking lot where there's always spaces available.